Hey! 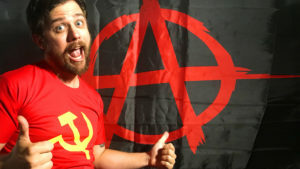 You got communism in my anarchism! 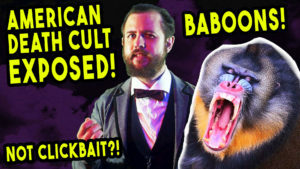 As a leftist YouTuber and blogger, I get a lot of push-back and negative comments every single day about my worldview and the content I generate. As you’d expect, the vast majority of the criticism I receive comes from white male reactionaries: they hate the idea of feminism. They love the idea of capitalism. They are resistant to fundamental changes that would upset the privileges they enjoy in our current society. These criticisms are generally easy for me to handle. They’re usually coming from a place of ignorance and fear. I know this because I used to BE a right-winger, myself. I know exactly what it feels like to have that nagging awareness deep in the back of your mind that you might be wrong about the world. This kind of existential doubt and discomfort lead me to be a very toxic and negative person for many years, as I’ve touched on in previous videos. I have always felt very prepared to deal with this kind of criticism. After all, YouTube (and the internet at large) is rife with alt right trolls and angry right-wingers, and leftist positions are few and far between in our society. As leftist content creators, we have to enter into this work with a thick skin and an understanding that we will come under continuous and relentless attack from the far right. Hell, I admit it, sometimes I even have fun knocking out an ignorant Nazi with cold, hard logic. When I receive criticism and negative feedback from my fellow leftists, it’s quite frankly a lot more difficult for me to process. I like to think we’re all on the same team, and I also like to think that I have done my homework and prepared myself before I choose to write an article or put together a video enough that I’ll essentially be preaching to the choir in leftist spaces. So when I read a negative comment from a fellow leftist it can really throw me for a loop. See, when a right-winger comes swinging, I swing right back without hesitation. 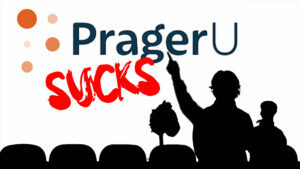 I know most of the arguments they’re going to make before they even make them, since I used to be on the far-right myself. And the more toxic and abusive their comments are, the less threatened I feel. Hell, I admit it, sometimes I even have fun knocking out an ignorant Nazi with cold, hard logic. This isn’t really a good thing, and it can even become performative and counter-productive (which is a whole other issue I’ll probably be writing about in a near-future blog post) but the TL;DR is that sticks and stones can break my bones but Nazi words can never hurt me. Leftist words, on the other hand, can really mess me up. I’m a big advocate of leftist unity, and I want very much for all of us on the far left to be on the same page, arm-in-arm, resisting the oppressive forces that dominate this world. Points of contention really concern me, because the division within and among leftists has done more to stymie our movement than any reactionary anti-leftist force in history. I get a LOT of negative from my fellow anarchists about my use of the sickle and hammer. So when I keep seeing the same negative comments cropping up about my videos, it really gives me pause. If something I’m saying or doing is unpopular with a signifant number of viewers, I really want to stop and reflect and self-crit and make sure I’m not wrong before proceeding to defend myself. I don’t mind being front-footed with reactionaries because I used to be a reactionary myself, and I know how wrong they are. But when it comes to leftists, I know I’m dealing with people who are, for the most part, principled and thoughtful and nuanced in their conception of the world. I take negative feedback from my fellow leftists very seriously. And I get a LOT of negative from my fellow anarchists about my use of the sickle and hammer. I composed this long preamble because I want you, the presumably leftist reader, to know that I have put a great deal of thought into what follows. I have examined the arguments against the sickle and hammer. I have weighed and considered them. 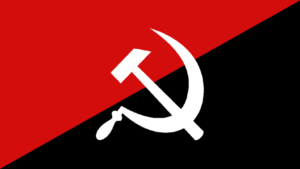 I realize that advocating for the display and use of the sickle and hammer symbol is a risky and controversial position to take. Worst of all, it is potentially divisive, and here I am, a guy who’s always preaching leftist unity. 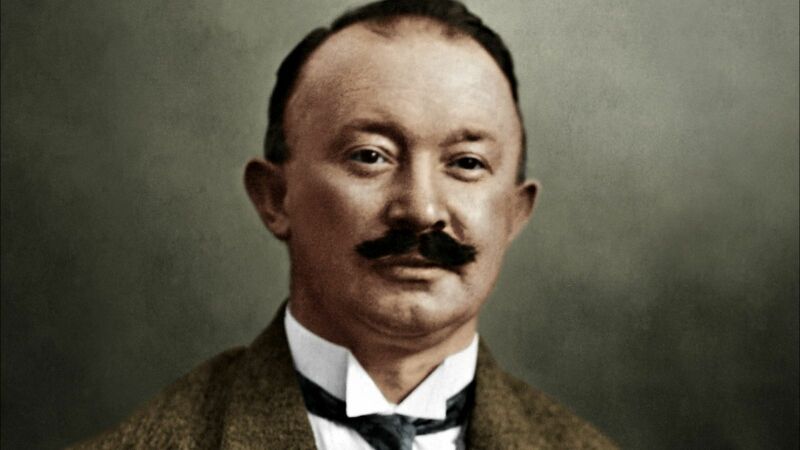 Hugo Boss was a big ol’ Nazi. This subject may seem flippant and unimportant. Should we really be this concerned about something as silly as a logo when there are people suffering capitalist exploitation, racist violence, sexist oppression, and all the other injustices of the world? Why am I even wasting my time typing up a diatribe about an old flag when there are so many more pressing issues that need to be addressed? The fact is that symbols really do matter. The way we present ourselves is important. As a student of history, I know just how powerful (and dangerous) symbolism can be for any political movement. There’s a reason Nazi Germany funneled so many resources into imagery and design. Incredibly talented designers like Hugo Boss and Karl Diebitsch designed uniforms, equipment, and logos for the Third Reich. Leni Riefenstahl was commissioned to create propaganda films with breathtaking and painstakingly composed photography. Everything the Nazis put their hands on, from the architecture of buildings to the artwork of postage stamps, was meant to intimidate, inspire, and indoctrinate the German people. And it was terrifyingly effective. Together, the sickle and hammer have origins that predate Soviet communism. Working tools have long been symbols of proletariat struggle. 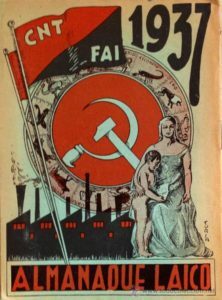 Used separately, there is no doubt that the hammer and the sickle have origins as workers’ symbols that predate the Soviet Union by thousands of years. The classical conception of a blacksmith or factory worker has long been a burly man with hammer in hand, depictions of farmers at work have always included reaping with sickles. Together, the sickle and hammer have origins which predate Soviet communism. 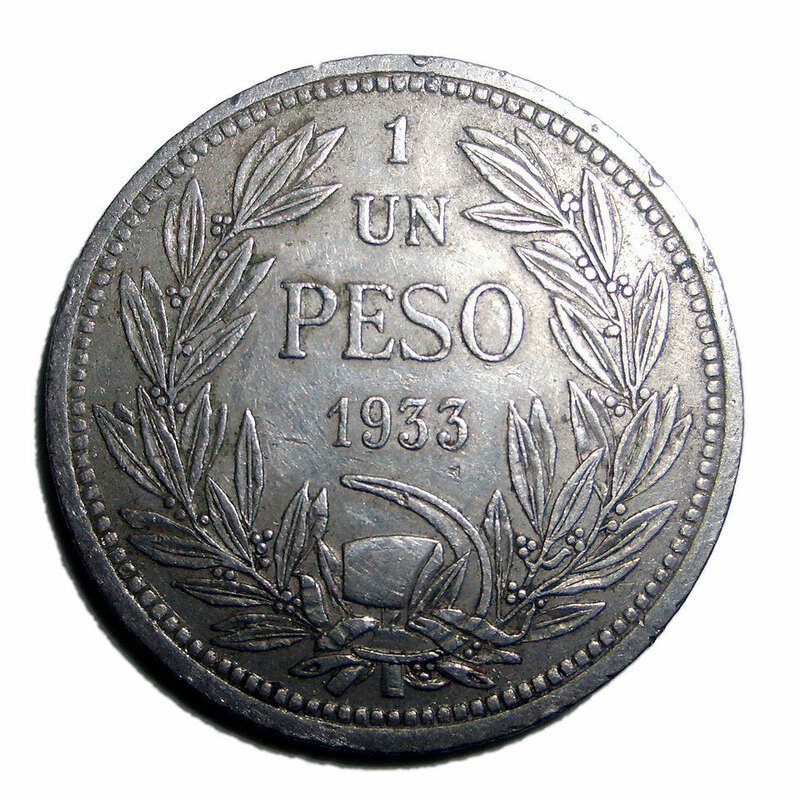 It’s hard to find concrete examples of these symbols being used together, but they have certainly been used together on Chilean coinage (albeit uncrossed) as a symbol of the working class since 1895. 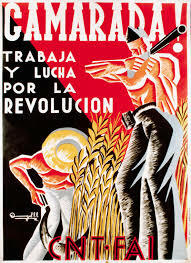 This Spanish-language blog article seems to go into more detail about the use of the symbols – I don’t speak Spanish, but from what I gather these symbols were commonly used together, non-politically, as a heraldic motif to represent the working classes long before the Communist revolution in Russia. 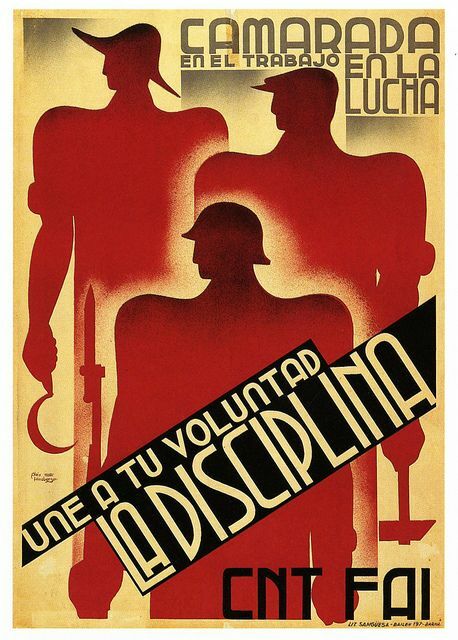 Early 20th century leftists understood the power of design, including Vladimir Lenin. One of the problems faced by early communist revolutionaries in Russia was a huge divide between urban workers and rural peasants. 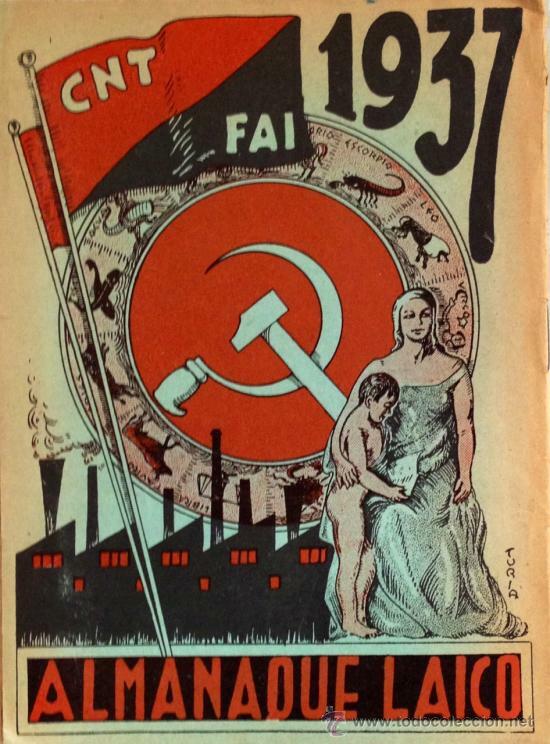 Early on, the Bolsheviks were largely rooted in industrial workers’ unions. Lenin and his Bolshevik contemporaries wanted to win peasants over to their cause. The first draft was a little busy, but it had some pretty sweet grain. I give it a B-. 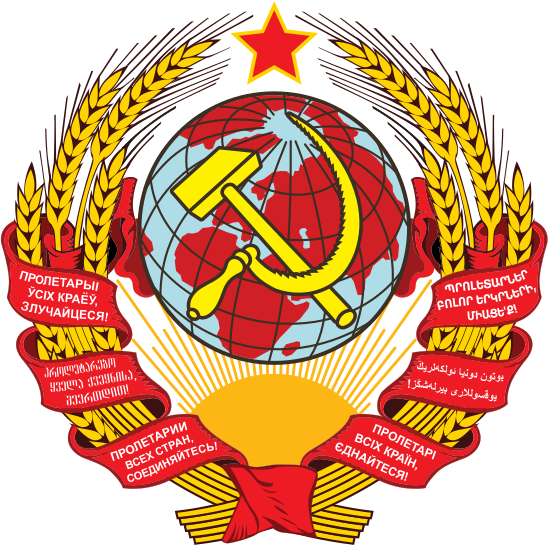 A design contest was held for a logo that would symbolize the unification of peasants and factory workers, and the winning design featured a sickle, a hammer, and a sword, though Lenin nixed the sword because he wanted to portray the new Soviet nation as peaceful. Symbols of the government and party, rituals, mass demonstrations, and social illustrations each played a vital role in revolutionary ideology. Party emblems, seals, iconography, posters, and political insignia, from the hammer and sickle to the red five point star, were essential mediums in conveying the messages of the revolution. In addition to the imagery of symbols, rituals and public demonstrations such as parades, unveilings, celebrations, chants, and motivational rhetoric in speech and communication found significance as well because they signified socio-political change, and indoctrinated Bolshevik ideology. Symbols and rituals of 1917 essentially set the parameters that defined post-revolutionary Russia. 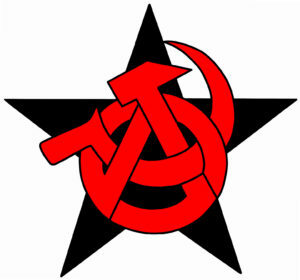 In conclusion, though the sickle and hammer as symbols have been used for centuries to represent the working class, there is no question that the iconic configuration of the sickle and hammer we know today was devised by the Soviets under the direction of Vladimir Lenin and the rest of the Bolshevik party leadership. Admittedly, these presentations are most often seen online. 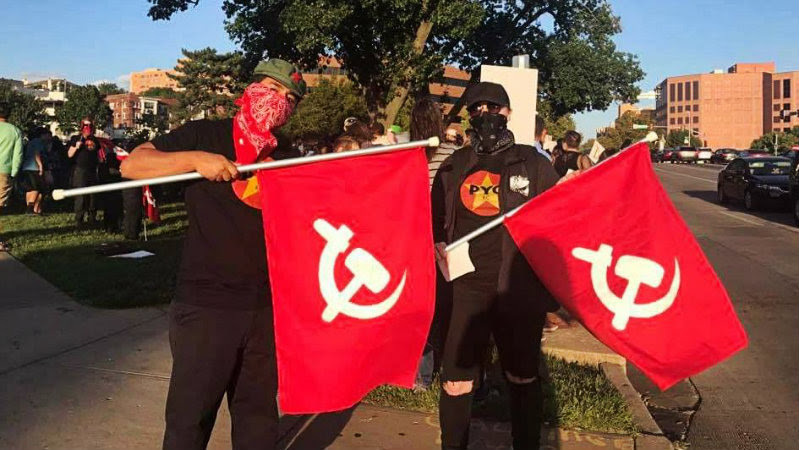 I have found very few images of anarchists and antifa demonstrators sporting the sickle and hammer in the real world (if you have any, I’d be very pleased if you send them my way), but I do see them used in online leftist memes, websites, and forum posts fairly frequently. All this to say that sickle and hammer symbolism is far from universal in anarchist communities, but it is also far from unprecedented and unheard of. This begs the question: why do so many anarchists reject the sickle and hammer? And why do some anarchists (including myself) choose to use a symbol that was devised by Lenin and tied directly to the state communism of the Soviet Union in the minds of most people? 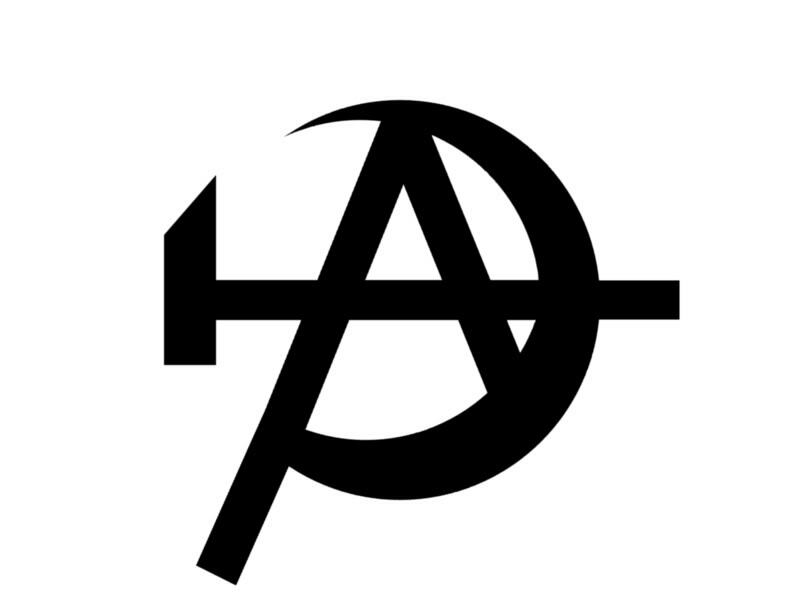 This is a complicated question, and I’ll try to unpack it by first presenting anarchist objections to the symbol and then submitting my responses, one-by-one. I understand that the USSR’s iconography is powerful (I’m a big fan of Soviet propaganda posters myself) but it’s the same flag that flew over gulags that killed millions of people for dissenting thought, and the soviet project itself was ultimately a failure. It might not be the best choice of motif for your channel. And it’s also ‘classic leftism’ – I’d like to think we’ve gone further since 1917. 1. The Soviet Union was a totalitarian state that killed millions of people and suppressed dissenting thought. 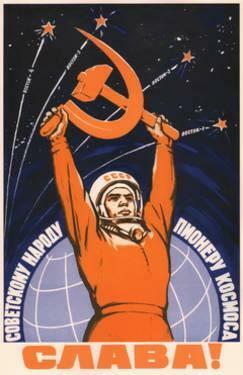 We should reject all Soviet symbolism. First of all, I will be the first to admit that the Soviet union was tremendously problematic. I recognize that the Soviet state committed atrocities. I know that the Soviets assassinated anarchists and imprisoned and executed a lot of good and innocent people. I am not naive and I am not a Soviet Union apologist. But I am also not willing to completely demonize the Soviets as completely evil villains of history. To begin with, we have to recognize that much of what we learn in school about the Soviet union is Western propaganda. Many — not all, but many — of the atrocities the Soviets alledgedly committed were grossly exaggerated or else completely fabricated by Western capitalists, Nazis, and other reactionary regimes. 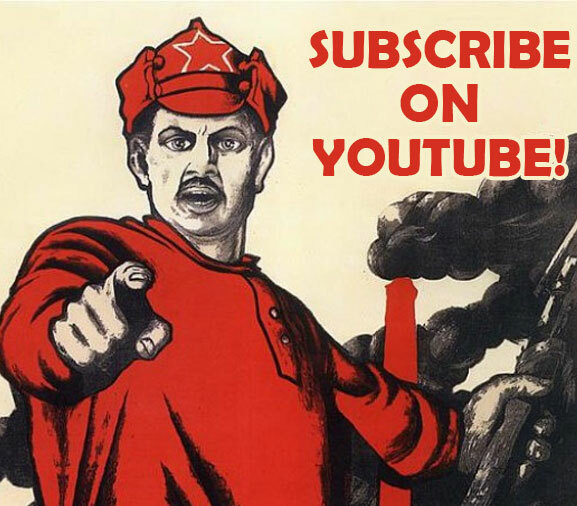 In the future, I hope to go into more detail about some of the more egregious anticommunist myths and lies about the Soviet Union, but for the time being, let it suffice to say that we as leftists should take the Western narrative of the USSR with a grain of salt (just as we should take the official narrative of Soviet officials themselves with a grain of salt). The Soviets and capitalists of the 20th century fought a propaganda war that lasted decades, so the fact is that it can be tremendously difficult to sort out fact from fiction when it comes to Soviet successes, failures, and atrocities. Did the Soviets do very bad things? Of course they did. But that doesn’t erase the good things that were achieved under Soviet leadership. 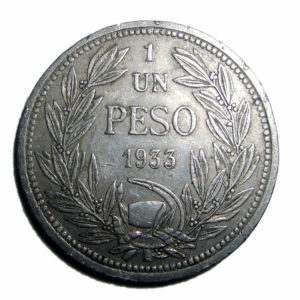 They were crucial for the defeat of Hitler in World War II, they helped to liberate Cuba and Vietnam from capitalist-imperialist and colonial rule, they made remarkable advances in science (including many victories in the space race), they had one of the highest literacy rates in the world (surpassing even the USA), and so on. It’s easy to forget where the Soviets began. Russia was a feudal agricultural nation under the absolute dictatorship of the Czar. They were devastated by World War I and had very little industry to speak of. The fact that they were able to become a world power with such industrial and military might in such short order is objectively impressive. 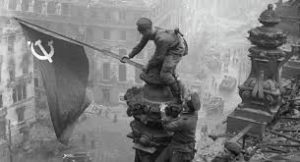 The accomplishments they made after the devastation they suffered in World War II is equally impressive, especially when you consider the tremendous pressure and aggression they faced from capitalist powers in the USA and Europe. This is not a love song for the USSR. I believe that their regime ultimately failed because of its authoritarian nature. I am, at the end of the day, an anarcho-communist, and I disagree adamantly with many of the decisions that were made by the Soviet Union. But when I look at the USSR in toto, especially compared to the capitalist-imperialist states they opposed, I have to conclude that they were generally on the right side of history and were able to accomplish a great deal from very humble beginnings. And, remember! The Soviet Union was not just its leadership. Set Stalin and Lenin and Khruschev aside and you still have millions of soldiers who fought and died beneath the sickle and hammer to defeat Hitler. You still have millions of workers and farmers who struggled and toiled together for decades to try and advance their own society. It’s easy to be cynical, in hindsight, and pretend that the people of the Soviet Union never bought into communism – that’s certainly what capitalist propaganda wants us to believe – but that erases the efforts and accomplishments and sacrifices of hundreds of thousands of comrades who did believe in the dream of the Soviet Union and did want to create a better world for the working people of the world. The Soviet Union was a major part of the history of leftism, and we must accept the role they played, warts and all. For my part, I may have strong criticism for many of the leaders of the Soviet Union, but I am proud of the good things they were able to accomplish. I will not disown them, but at the same time, I will recognize their faults and flaws and learn from their mistakes. The Soviets were people, and people are flawed. Most of us call ourselves Marxists even though Marx himself was highly problematic. 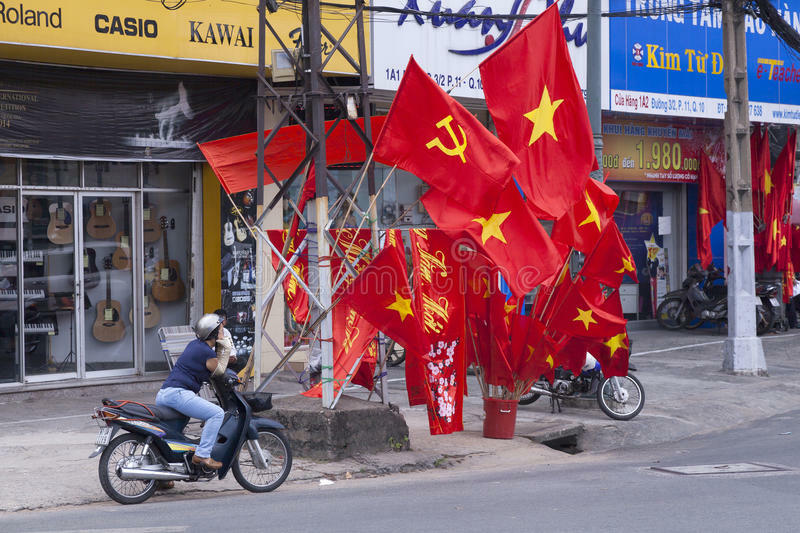 Is there anything more capitalist than selling communist flags? 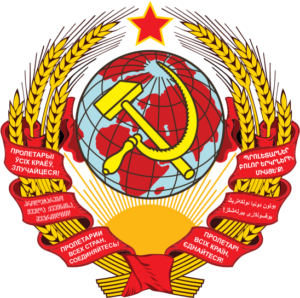 In addition, the sickle and hammer logo was not only used by the Soviet Union! Cuba and Vietnam use the sickle and hammer to this day. Granted, these regimes were never perfect. I live in Vietnam, and I know full well that the communist party of Vietnam has tremendous problems with corruption. I understand very well the mistakes that have been made by Vietnamese communist leadership, including the assassination of Trotskyists and anarchists and the abuses against South Vietnamese citizens which occurred immediately after the war. I have personally interviewed communist dissident Nguyen Dan Que who has been imprisoned several times for speaking out against government corruption. But I’ve also talked to many Vietnamese veterans who fought for leftist ideals. I have heard their stories about watching their friends and family members die before their eyes. Many of these freedom fighters proudly display the sickle and hammer to this day. As they explain it to me, the nation and its government may not be perfect, but it is their nation. 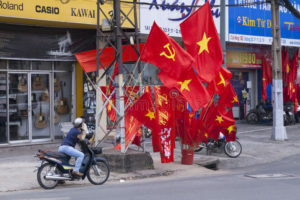 Vietnamese communists – with tremendous support from the Soviet Union – did repel American imperialism and overthrow colonial rule that stretches back over a thousand years, they have managed to rebuild their nation after being “bombed into the stone age” by the mightiest military in the world, and they did liberate Cambodia from Pol Pot. They are also one of the happiest countries in the world according to the Happiness Index. These are all leftist accomplishments worth celebrating. As for Cuba, again, they have their fair share of problems and failures. But they also have one of the best medical systems in the world, including universal healthcare, their international disaster relief is the finest in the world, they provide free education to citizens and their literacy rate is among the highest in the world. Today they are making strides in combating sexism and racism and eliminating poverty. The fact that the Soviet Union and its allies have been less than perfect is not an excuse to completely throw the baby out with the bath water nor to completely disown the legacy of the sickle and hammer in my mind. To me, the sickle and hammer represents more than just the states and their leaders. They also represent the millions of comrades who have fought and died in class struggle. To be sure, leftist thought and theory has had tremendous advances since the collapse of the Soviet Union. In my mind, one of the biggest and most important advances has been the concept of intersectionality. 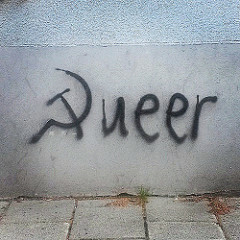 20th century classical communists could scarcely have conceived of the ways in which we are combining the struggle against capitalism with struggles against racism, sexism, transphobia, homophobia, and so many other social ills. But we did not invent these ideas from whole cloth. Earlier communists were concerned with solidarity between races and liberation of women, even if their concepts of intersectionality were less developed in their time. Just because past leftists made mistakes and, yes, even committed atrocities, that doesn’t mean I want to sever myself from them. On the contrary, I think it’s important to celebrate what they were able to accomplish in such dire circumstances. Furthermore, I believe that trying to distance ourselves from past communists will ultimately backfire. I believe that people are very sensitive to authenticity and falseness. I strongly believe that trying to deny and distance ourselves from our political heritage, such as it is, would ring incredibly false. I am a marketing professional, and I have watched closely how entities deal with crises and other such problematic situations over the years. Efforts to rebrand in order to conceal or evade mistakes and failures always meet with embarrassing failure. As an example, look no further than BP. After the Deepwater Horizon disaster of 2010, BP came under heavy fire. It was one of the worst PR disasters in history. In the fallout, BP decided to rebrand, updating their logo. This was met with public outcry and derision and a flurry of vicious memes calling them out on their attempt to distance themselves from their mistakes. Imagine if McDonald’s had a terrible PR disaster. Say, for example, a batch of bad Chicken McNuggets killed a thousand people across America. Now, let’s say McDonald’s responded to this disaster by… changing their logo. How do you think people would react to that decision? This may come as a surprise, but I believe every leftist should study marketing. We should have a good grasp on the way corporate branding, PR, and advertising, because they have spent billions of dollars and employed some of the best minds in history to develop the craft of human communication. 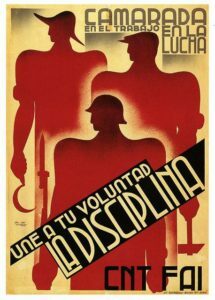 Just as we can learn about good design from the Nazis, we can also learn about branding and marketing our ideas from the capitalist opposition. Chasing someone else’s notion of cool is the biggest mistake one can possibly make. . . The only way to build a true communion with an audience – to a point where they might deem you or your work ‘cool’ – is to follow a personal vision and stay true to that vision no matter what. How could you not want that dude to be your comrade? For me, the history of our movement is a vital aspect of who we are today. When I think of the struggle and sacrifices of the generations of leftists who came before me, I find myself humbled and awe-stricken. Their successes and their victories and, yes, their failures and flaws, lead us directly to where we are today. I don’t want to distance myself from any comrade who fought or died for the working class. I want to celebrate them and learn from them and incorporate that lineage into the identity of our contemporary movement. For me, the sickle and hammer is an important part of our story, and one that I choose to adopt in my work today. If you’re an anarchist and you don’t want to incorporate communist symbols into your praxis, then I absolutely support your decision. 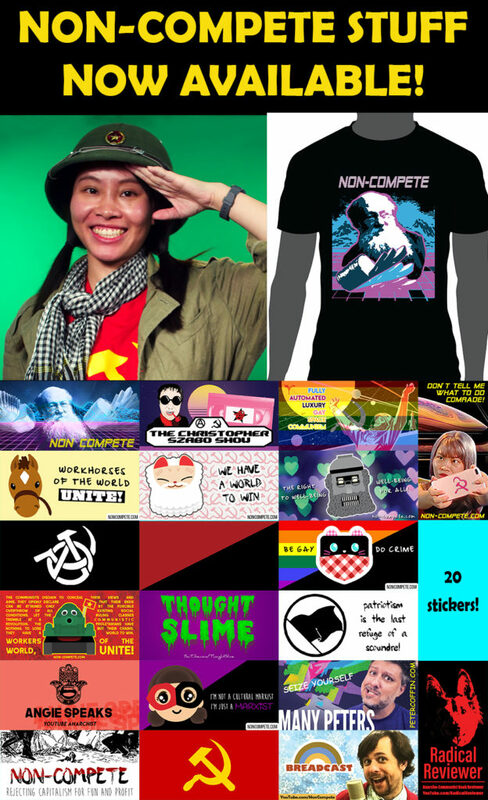 As for me, I am an anarcho-communist. 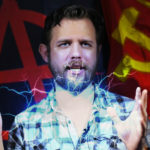 If I were to try to pretend my ideology has no connection whatsoever to 20th century state communism, I can’t expect anyone to take me seriously. It’s much better to say, “Those Marxists were human, they made mistakes and put some bad people in power and also did some terrible things, but I understand how and why they made those mistakes and how those mistakes can be prevented moving forward.” Owning up to the past gives me a lot more credibility with people who are actually paying attention and engaging with my content. I also feel like there’s something to be said for the dynamics of leftist solidarity and unity that come with using a symbol that was designed by Lenin even though I, myself, am not a Marxist-Leninist. I hope that principled ML comrades will see it as the olive branch that I am symbolically extending by incorporating one of their symbols into my own leftist identity. For my part, I feel plenty of warm fuzzies when I see Marxist-Leninists flying the black-and-red-flags logo common in Antifa circles. 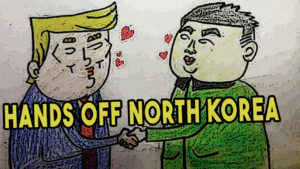 In my mind, we are on the same side, and though we might have some disagreements we can still stand side-by-side and share some symbols and beliefs. 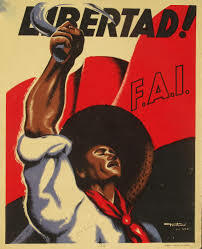 I have a lot more to say about leftist unity, but I’ll leave it at this for now: I don’t hate Marxist-Leninists, on the contrary I have some good ML comrades, such as Patrick with the First Marxist Leninist Demonstration of South Carolina, so the fact that Lenin played a hand in the symbol’s design doesn’t keep me up at night. It’s true: the sickle and hammer is an instantly recognizable. In marketing terms, it’s a “powerful brand,” and it does, indeed, evoke an instant emotional response. In simplistic terms, there is something to be said for “shock value.” If nothing else, shocking people can get them to pay attention to messaging they might otherwise ignore. This shock value definitely worked on me. When I first moved to Vietnam, I was completely creeped the hell out by all the sickles and hammers I saw. I was still a centrist when I first moved here and in my mind it was absolutely no different than seeing a bunch of Nazi swastikas hung up all over the place. It made me feel uncomfortable and alarmed. In hindsight I can definitely say that this exposure made me really curious about this kind of aggressive, in-your-face leftism and sent me on some of my first forays into Googling modern-day communism. On the inverse, there is also a case to be made for normalization of leftist words and symbols. After my first week in Vietnam, the sickle and hammer stopped being so scary. I barely even noticed them after a month or two, they just blended into the background. Fast forward a few years to the 2016 election. This was when I learned for certain that stigmatized symbols, words, and ideas CAN be rehabilitated and inserted back into the mainstream. A great example of this is Bernie Sanders’ use of the word “socialism.” It’s hard to remember and even believe now, but just a couple of years ago the word “socialism” was absolutely a dirty word in USA politics. 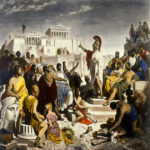 No Democrat in their right mind would admit to being a socialist or advocating socialism, such was the success of Republican propaganda efforts against that word. 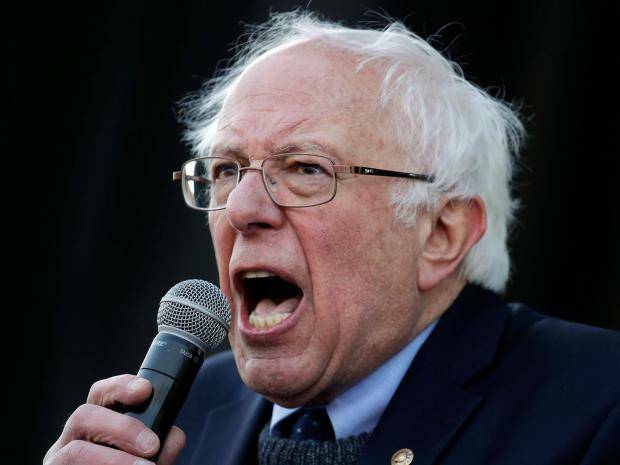 Then Bernie came forward and started using the word “socialism” in every other dang sentence. In the beginning of his campaign, he was considered extremely fringe for using that word, but the more he used it, the more normalized it became, and the more people were willing to actually analyze it and see what it really meant. For my part this was fundamental to radicalizing me to the left, because I was one of those people who bought into the idea that socialism was evil before Bernie first: normalized it in my mind then, second: got me to pay attention to the positive aspects of socialism and the evils of capitalism. When I began to dig deeper into true leftism, I went through this same process of normalization all over again. Seeing the sickle and hammer plastered all over leftist Facebook and Reddit groups freaked me out at first. 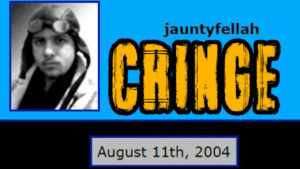 I felt like I was falling into some dark corner of the Deep Web where evil lurked. For the first week or two I was incredibly weirded out by talking to these people with their black flags and their sickle and hammer avatars, but over time it became normal, and my mind was able to reinterpret these symbols as friendly and welcoming. Normalizing radical language and symbols is a basic Overton Window strategy, and one which the far right has been using to net real results in politics. We should not shy away from our own authentic political identities and having pride in our leftism, even if we know there will be initial pushback and resistance. Believe it or not, I’m honestly not trying to sell you on the sickle and hammer. I don’t really care if you use it or not. If you don’t feel like this symbol represents your political identity and ideology then I don’t expect you to use it. This is simply my explanation for why I, personally, identify with the sickle and hammer and choose to display it in my content. If you disagree with me, that’s totally fine. I welcome your dissent. For my part, we can still be comrades. I just hope you realize that my decision to use the sickle and hammer came with careful consideration, and I hope you’ll consider my points carefully before attacking my use of the symbol. Hell, I could be wrong! If I am, I’m sure I’ll hear about it. 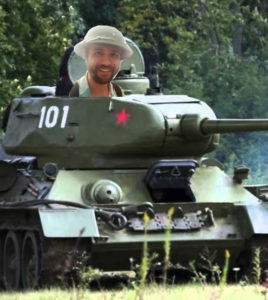 If, after reading this entire article, you still think I’m tankie scum for using the sickle and hammer, feel free to drop a comment on Facebook, Twitter, YouTube, or Mastodon!